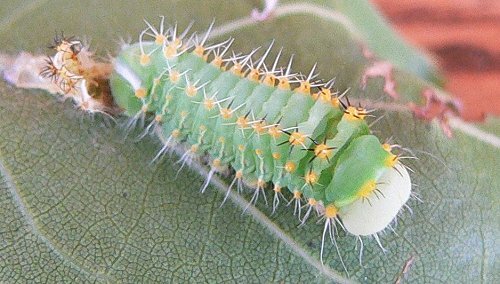 Caterpillar foods: leaves of broad leaved trees and shrubs including birch, grape, hickory, maple, oak, willow, and species in the rose family. 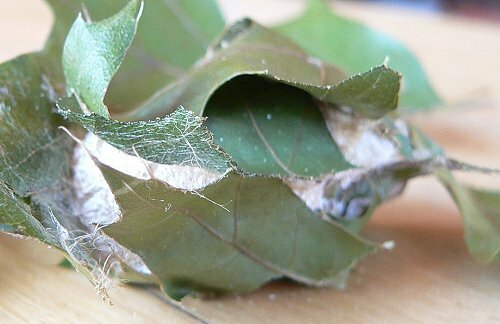 (Bugguide) I’ve reared many of these moths on oak leaves. 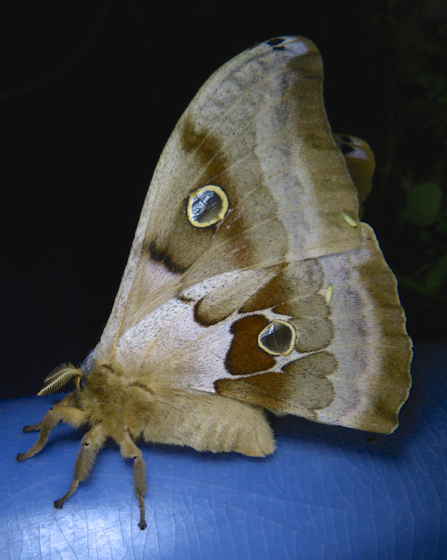 Polyphemus Moths are common here in west-central Wisconsin, but for a long time I had never seen any. 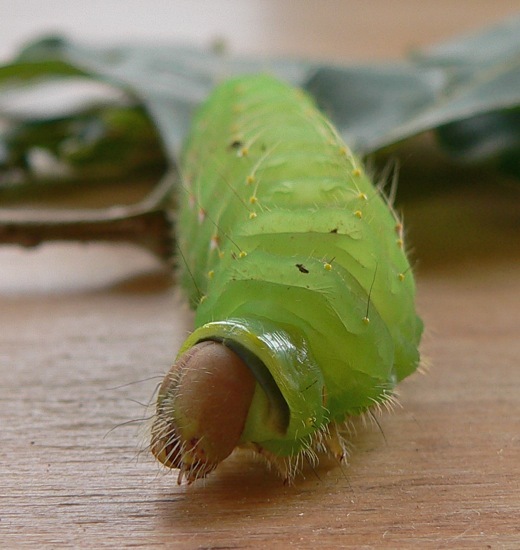 A few years ago some friends found a large Polyphemus moth caterpillar on the ground on one of our paths. 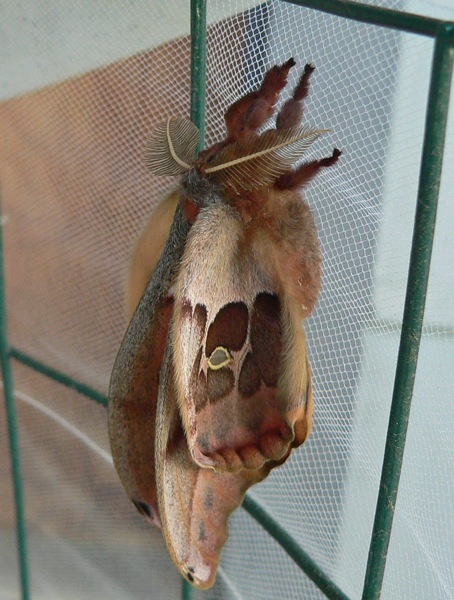 After a few days it made a cocoon. 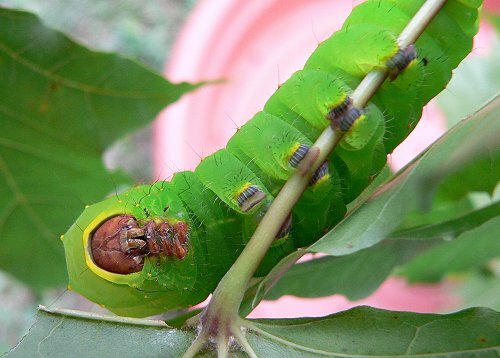 I kept it over the winter, and in the spring, when it hatched, it turned out to be a female. It hatched on May 23, 2006. It mated on May 27. 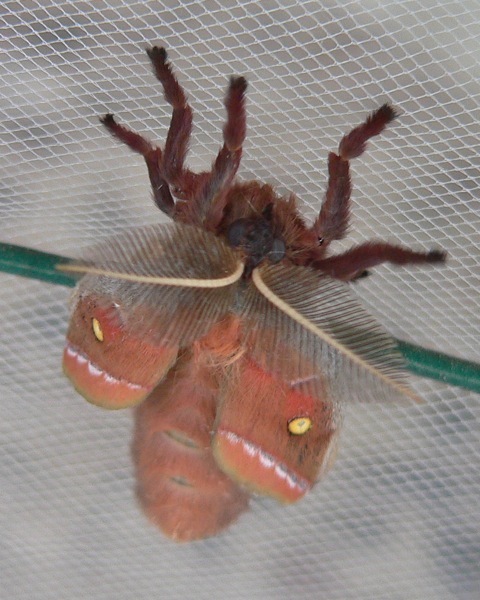 I kept some of the eggs, and I’ve been raising and releasing Polyphemus moths ever since. 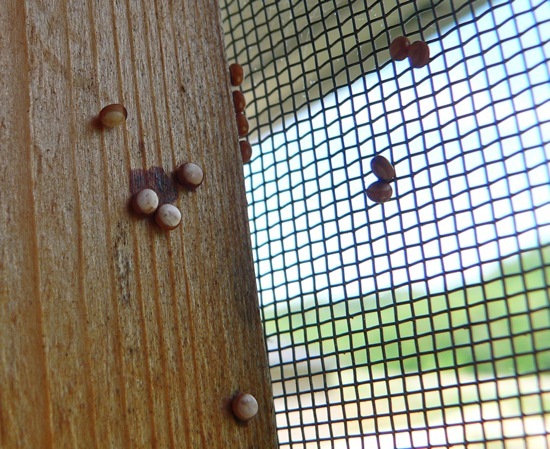 Here are some eggs that the female, who escaped from her cage, laid all over the walls of our porch. 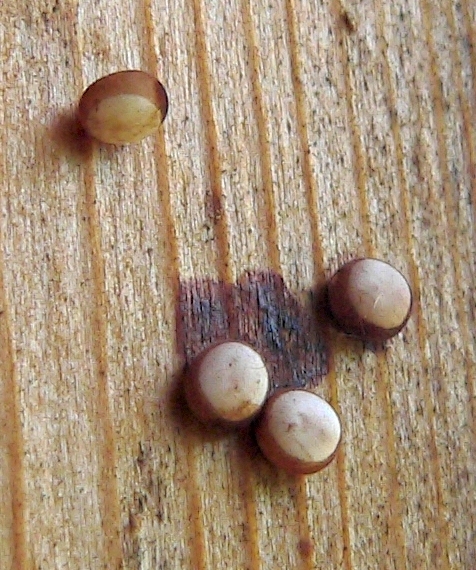 The dark brown patch is the “glue” that cements them to the surface. 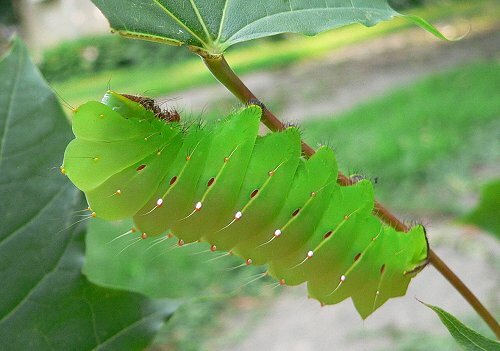 Polyphemus caterpillars can eat the leaves of many different trees and shrubs. 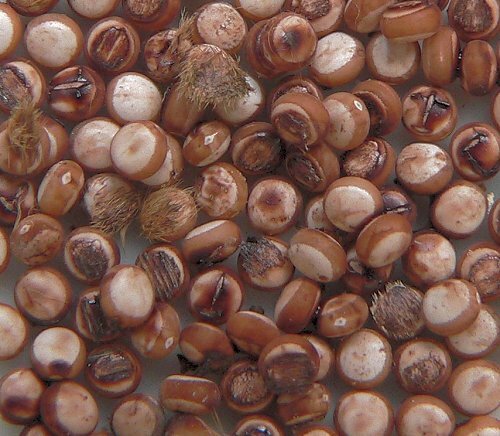 The lists I’ve seen include: Ash, Birch, Grapes, Hickory, Maple, Oak, Pine, and Cherry. 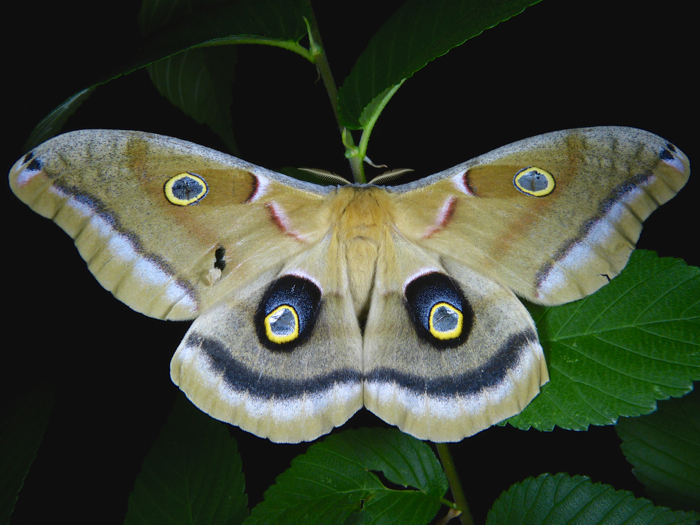 Like other Giant Silk Moths, once they start eating one kind of leaf, they don’t like to switch. 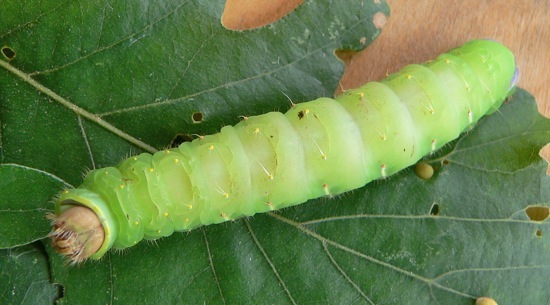 I feed mine on oak leaves. 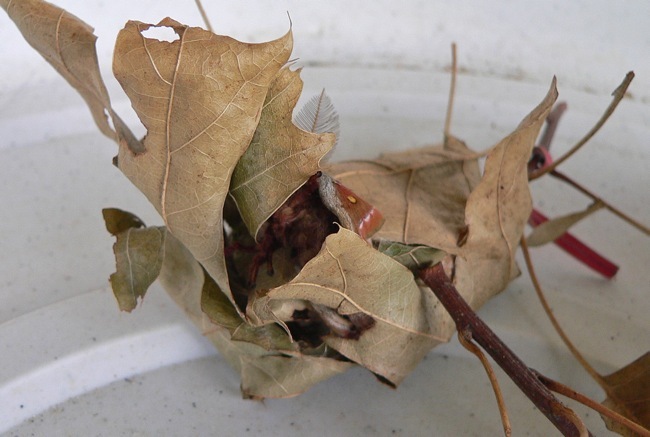 For a while I stuck to oaks in the “black oak” group – Black and Red Oak, but I’ve also fed them White and Burr Oak and they don’t seem to care. 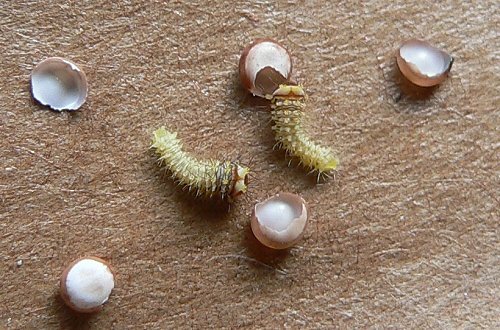 They make their cocoons wrapped up in leaves – usually leaves that have fallen on the ground – or on the floor of their cage. 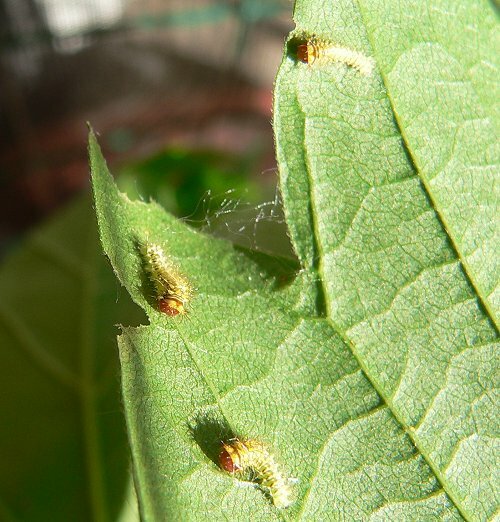 They spend the winter as cocoons, and sometime in May, the adults emerge. 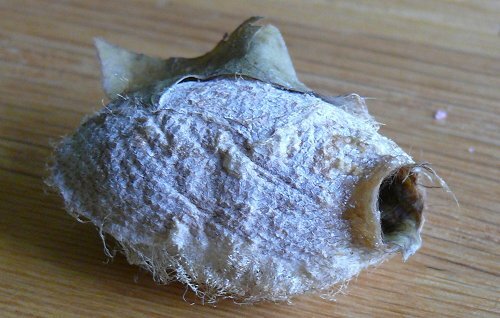 A cocoon after the moth has emerged. 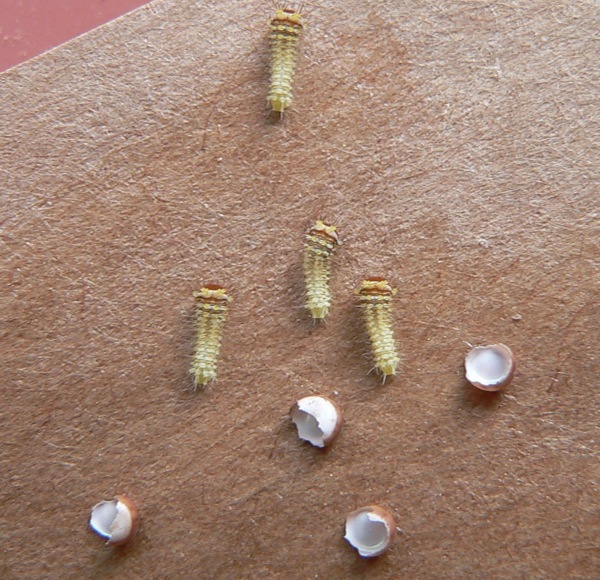 Here’s a sequence of a male moth emerging from its cocoon – May 16, 2007. 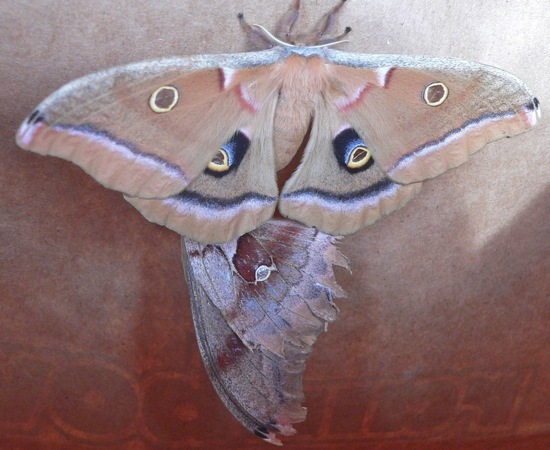 Wings are inflated; now the moth gently moves its wings for an hour or so until they’re dry and hardened. 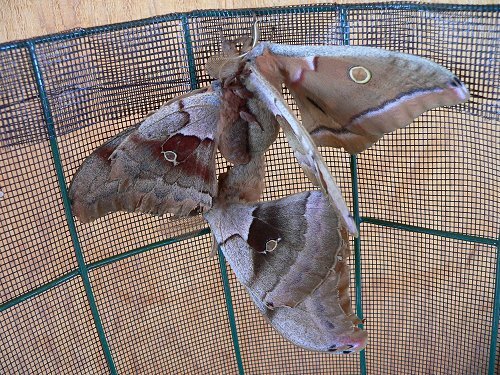 The moths usually emerge during the day, and by evening they’re ready to mate. 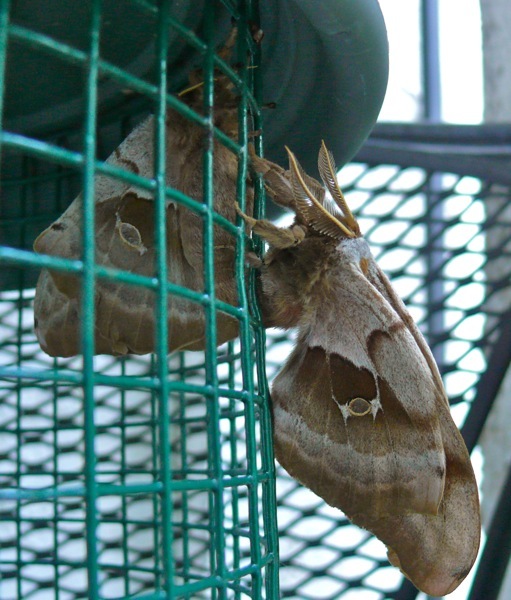 The males get impatient to fly at dusk – I hear them flapping against the walls of the cage – and I release them. 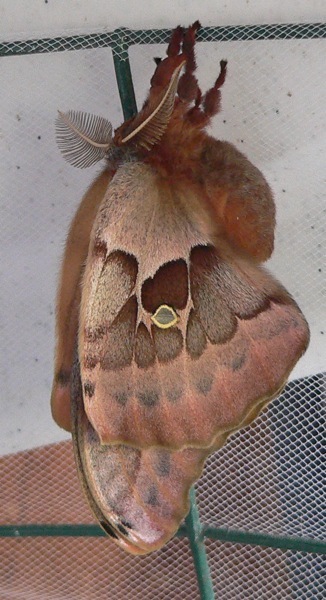 The females sit still, usually at the top edge of the cage. 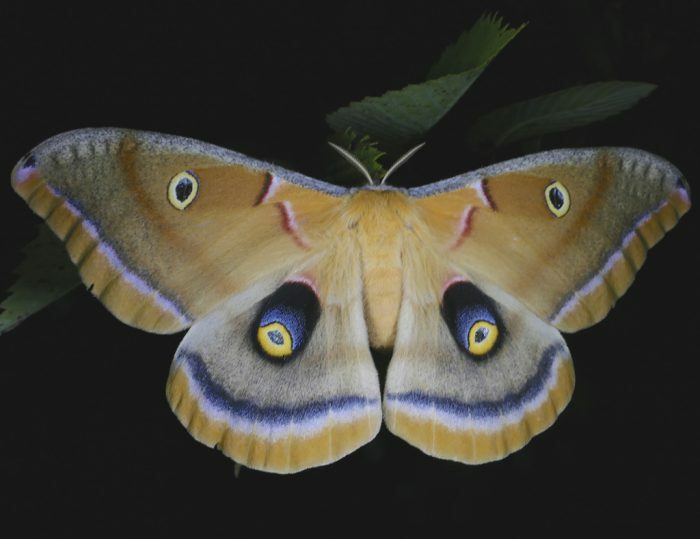 Males start showing up at midnight or 1 am. 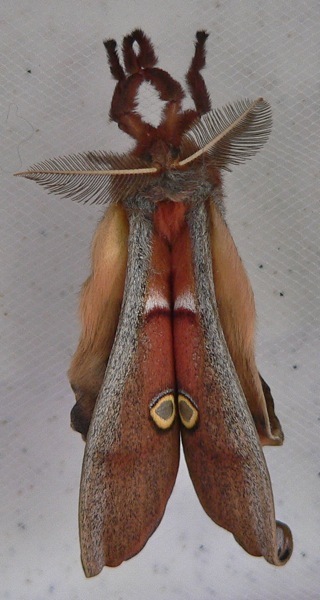 In this case, two males mated with one female – this seems to happen often. There’s usually a scramble to figure out who will mate with each female, and then it resolves itself into two or three, or sometimes even four moths in the cluster. The couples (or the cluster) usually stay together until dusk of the following day. By dark they’re both ready to fly – flapping against the cage. 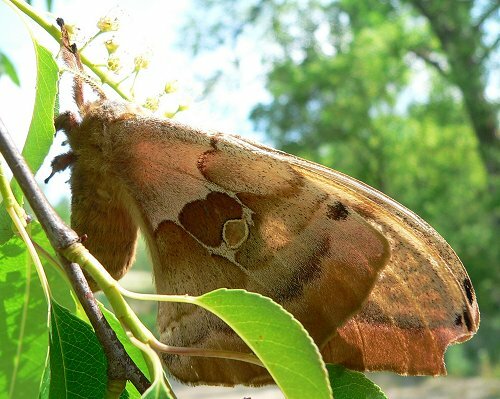 Here’s a female in a cherry tree. I had released her the night before, and she was still there the next day. Other individuals that came to my lights.